You should have received an reply to your email. If not let me know. I will have one ready to send to you by tomorrow. Plan to make several today. Help, the four of us are looking for a good home. We are all from the same family but are willing to go our separate ways in search of new homes. We all promise to set your X Y and Z axis to a perfect zero every time. To make it even better we will do all three axis with one command. We are magic like that! Contact Charley if you would like to get us away from Charley's relentless scrutiny. We are ready to jump right in to a US Post Office small flat rate box and pack up our CD that has videos, a User Manual, G-Code Generator Spreadsheet, Stepper Calibration Spreadsheet, a Wiring Guide, and some pre made g-code. We each have a banana plug and alligator clip to keep us company. We can leave tomorrow and be at your house in about 3 days if you live in the US. So send Charley an email and he will send you the adoption papers through PayPal. The cost of adoption is $36.80 which includes shipping in the US. I think two of my brothers are spoken for but that has not been confirmed yet. But there are for sure two of still looking for a new home. What a deal! Charley's email is charleyntexas@gmail.com. We look forward to meeting you. Help, the four of us are looking for a good home. Ok, I'm down to one left. I will be making more so don't worry if you miss out today. I sent details, should be good to go . As of 04/06/2016 I have sold all the completed kits. I will start on the next batch tomorrow as soon as I shipped out everything I have sold. I will post again as soon as more are available. Probably tomorrow evening. If you would like to get one go ahead and email me and I will put you on the list and fill orders first come first serve. PayPal seems to be the choice payment method for everyone and even though they take their share, it does make it easier on me. So I will continue to send PayPal invoices upon request. I have moved this to the For Sale Section since I am now selling them and thought that was a more appropriate place to list it. Thank you to all that have already purchased this and I look forward to hearing your success stories. i finished my upgrade from shapeoko to X-carve. I used your exel sheet to zero all my 3 axis in UGS. I have a small problem. The x and y axis work very well. The z axis is the problem. After the bit touching the y side off the plate the z-axis does not raise first but starts lowering directly. 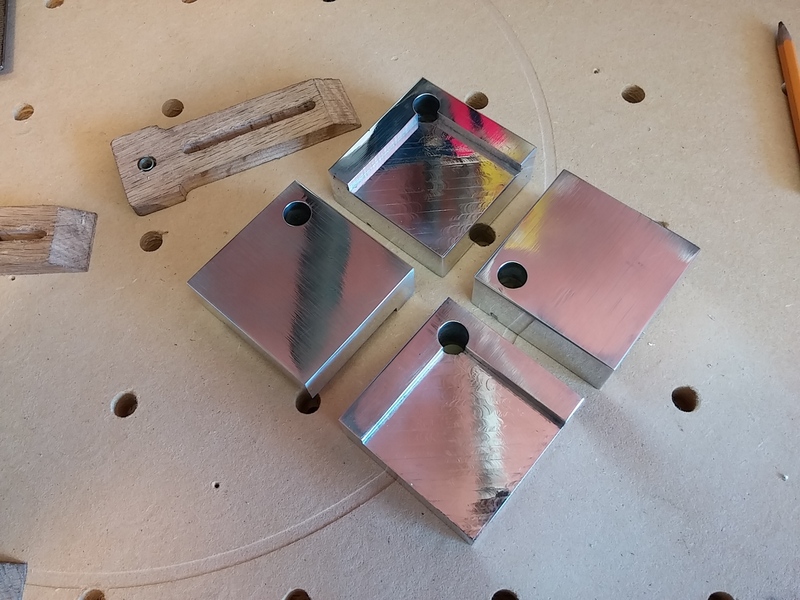 my touch plate is 10mm thick. See my measurements. Am i doinig it correctly? The commas as a decimal separator is causing your problem. GRBL requires periods instead. I also noticed that you are using a very old version of the G-Code Generator which can also cause an issue. I recommend that you download version 6 which is on the Triquetra User page. The version you are using can sometimes run the x in the wrong direction under certain conditions. I made a account but it says account is pending. Your all hooked up now. You should have access. Hi Charley, the version I have of the G-Code generator effectively runs the X in the wrong direction going away from my stop block! I'm new to G-Code and I can't stop scratching my head on this one. Are you using Mach3 by chance? No problem. Another thought, are you putting the touch plate on the left corner of your material or the right? It should be on the left front corner. 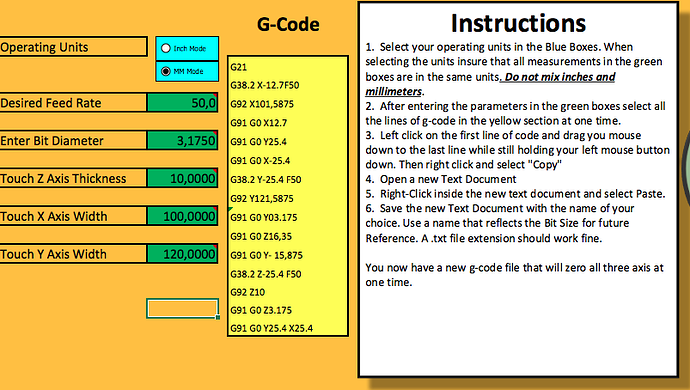 When you send the file also let me know what the version number is on the G-Code Generator Spreadsheet. I will look it over and get back to you as soon as possible. yes I put it on the bottom left corner. the version of the G-Code Generator spreadsheet is the Excel 2007 one. I can't find any version number is this one. I've had it since april last year.